In a world full of not-so-special special editions, over-priced, elaborate reissues and endless 'bonus' content, it's always exciting to see musicians find off-the-wall ways to make their releases stand out. Below are ten of our favourite weird, creative and unusual music release formats. Ranging from the genuinely intriguing to the utterly pointless. What weird or clever releases have we missed? Did you buy any of those below? Has anyone tried Max Tundra's soup? Let us know in the comments section below. 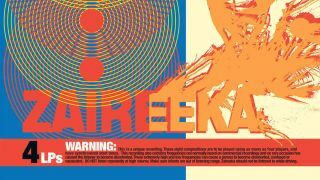 The Flaming Lips' eighth album Zaireeka was inspired by vocalist Wayne Coyne's Parking Lot Experiments - a series of concerts that involved 40 separate cassettes tapes being played simultaneously on different car stereos. The album itself was set of four CDs, which were intended to be played simultaneously across any configuration of four different stereos. The idea being that factors such as the position and quality of each CD player, natural reverb and slight variations in synchronisation would create a different listening experience each time the album was played. You can listen to the whole, pieced together album on YouTube, although this sort of misses the point of the whole thing. Don't Break My Love is a label sampler curated by electronic musician Nicolas Jaar, showcasing tracks by artists (himself included) associated with his Clown & Sunset Aesthetics label. The compilation was only released in one format, known as The Prism, which took the form of a palm-sized aluminium cube. Supposedly designed to promote physicality and connectivity in music, The Prism was a rechargeable player complete with a limited controls and a pair of headphone sockets, so that two people could listen to the music at once. Jack White seems to have something of a penchant for peculiar methods of releasing music (more on that below.) This single, from his band The Dead Weather, released on his own label Third Man, saw White and co. inventing the triple-decker vinyl. Effectively, said triple-decker record involves a standard 12-inch, complete with b-sides, with another 7-inch record stored inside it. In the video above White demonstrates how to remove one from the other, explaining that you'll likely "require a Swiss-Army knife or screwdriver" to access the exclusive track on the inner disc. Back in 1997, Scottish rock icons Mogwai released a version of their single Tracy via a small, old-fashioned hand-cranked music box. We say 'version' as music box, technologically limited as it is, actually only played a basic rendition of the track's main guitar riff. Nonetheless, the results are pretty lovely. Rather than record it himself, Beck released his 2012 Song Reader album in sheet music form, with the intention that other musicians should interpret and perform the music themselves. Beck's Song Reader site now hosts interpretations of the album's 11 songs, submitted by fans and musicians. Interestingly, you can also download MIDI data for each from the site too. In a fairly creative marketing move, alongside the standard release of his 2009 album The Ecstatic, rapper Mos Def teamed up with fashion designer LnA to put the record out in t-shirt form. Unfortunately, this didn't actually mean the t-shirt itself was playable in some way (although we really hope some foolhardy soul out there did buy one and try shoving it into a CD player or attaching it to a turntable.) Rather, the t-shirt featured the album cover on it's front, the tracklist on the back and came with a download code on its tag. Effectively, it was a wearable version of the album sleeve - which is still pretty cool, when you think about it. It's little surprise that Jack White is a repeat offender in this field. After all, we are talking about a man who, before finding fame with the White stripes, supposedly hid early vinyl recordings inside items of furniture he was repairing as part of his job as an upholsterer. These records - which were given out at Third Man Records' 3rd anniversary party - collect the first 56 songs released as part of the label's Blue Series on a single 12-inch vinyl. The catch, however, is that in order to fit such a large amount of music on to a single disc, the record needs to be played at 3rpm in order to be heard properly. Bearing in mind that 33rpm is the slowest speed setting on most mass-produced record players, doing so is pretty much impossible. The record label themselves stated "we estimate it would take 333 days of 33 hours training per day for your finger, hand, and arm muscles to spin at a continuous speed of 3rpm." Alongside the standard CD and vinyl formats, English electronic musician Ben Jacobs a.k.a Max Tundra's 2008 album Parallax Error Beheads You was also released via a can of soup. The can, which featured Jacob on its sleeve, contained a portion of Kosher Chicken Soup (described as 'hearty, healthy meal for one') along with a download code to grab an MP3 version of the album. Tragically, although there are plenty of positive reviews of the record online, we're yet to find any critical appraisals of the soup itself. The track was issued on a USB drive stashed inside a fairly cute, diamond shaped soft-vinyl toy named Translucent Red. Not only did the drive contain the single itself, but it came bundled with a grand total of 113 bonus tracks, 1500 photos, 20 music videos and a 60 minute concert film. Which is fairly good value, even at the $50 asking price. Chinese electronic music duo FM3 are best known for their 2005 release Buddha Machine. The release, which was apparently inspired by Buddhist chanting, came in the form of a device around the size of a cigarette pack, which came loaded with nine drone-like loops and featured a single control for cycling through them. More recently, the project has been replicated as an iOS app, which you can buy from the App Store.